With the world moving towards electric mobility, we will soon see roads filled with electric vehicles. While the future of electric mobility is still a few years away in India, the Chinese market is filled with electric vehicles and the consumers have accepted the vehicles quite well. There are many kinds of electric vehicle on sale in the Chinese market including the locally-made ones. 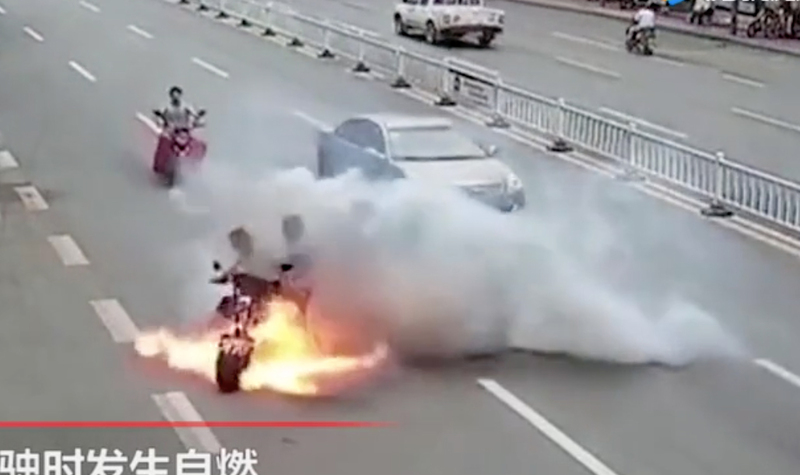 Here is a video of a locally assembled electric two-wheeler in China that catches fire within seconds and was reduced to ashes. Electric vehicles use complicated charging modules and have big batteries that power the electric motor. Most of the modern-day electric vehicles get the highly efficient lithium-ion batteries, which are known for their excellent capacity and charge hold time. However, the lithium-ion batteries can be extremely dangerous. As seen in the video, the scooter catches fire in the middle of the road and within seconds the whole vehicle is engulfed in the fire. Lithium-ion batteries can get affected in many various ways. It can be because of a short-circuit or a punctured battery pack. The fire can spread uncontrollably. To ensure that the batteries remain safe and avoid any such incident, manufacturers often install safety device that can cut off the power supply to the battery during a short circuit. Many manufacturers also place them in secured enclosures to avoid any punctures, especially during high-speed accidents. It is not only about low-cost electric vehicles being vulnerable to such accidents. Many Tesla vehicles have also caught fire after accidents due to the lithium-ion batteries. While the electric future looks unavoidable now, manufacturers should be working towards the vehicles safer. Electric vehicles can explode during accidents and that reduces any chance of survival. The shocking incident in China also shows police officers carrying fire extinguishers and dousing the out-of-control fire. Even with the extinguisher, it takes some time to bring the fire under control. There is no doubt that electric vehicles are the future but will be safer than the regular vehicles in the market? That’s a big question that remains unanswered for the time being.